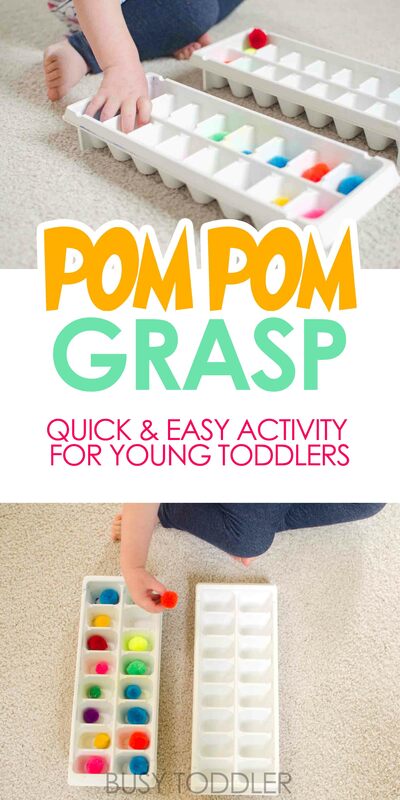 Try pom pom grasp for a quick and easy activity. My young toddler is just 18 months old, but she’s already itching to be a part of all the “projects” that go on around our house. 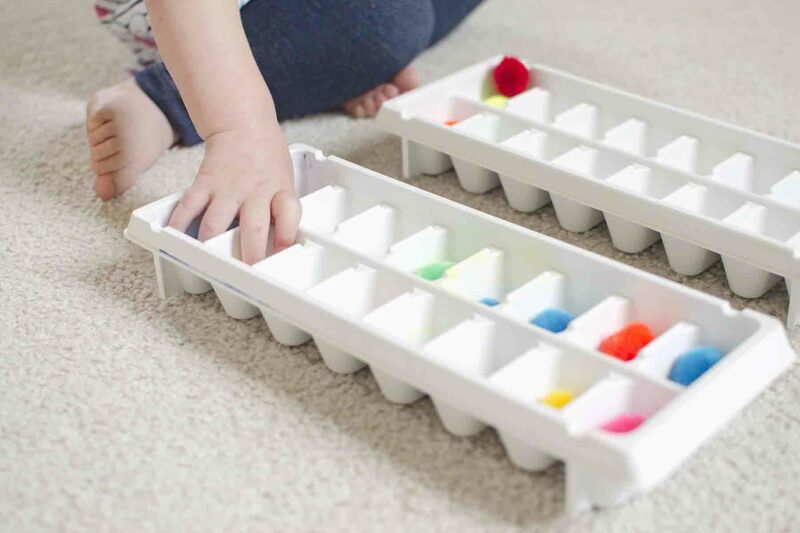 My job right now is looking for simple and engaging activities that meet all my criteria for young toddlers – pom pom grasp fits the bill perfectly. Will buy me even just a couple of minutes. Young toddlers have tiny attention spans so I’m not about to spend more than 30 seconds setting up an activity since she might only play for 30 seconds (let’s be honest). 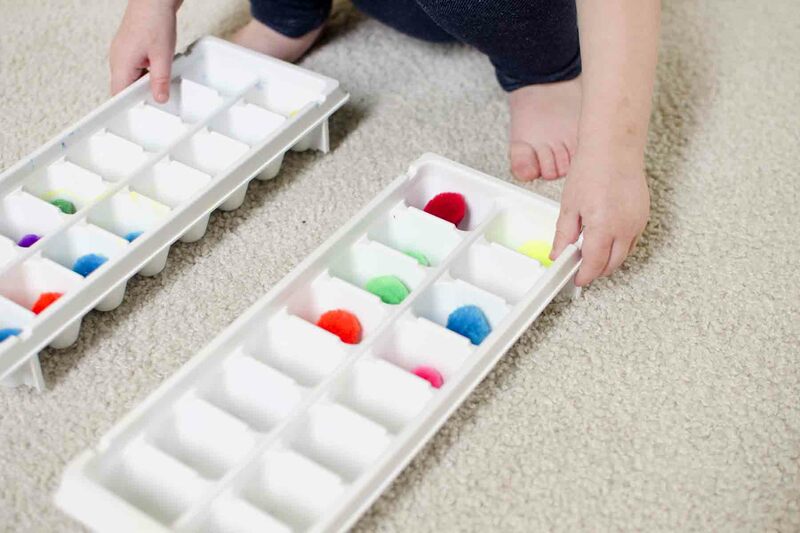 Like I said – this activity is simple which is exactly how I like my toddler activities (especially when those activities are for an 18 month old). 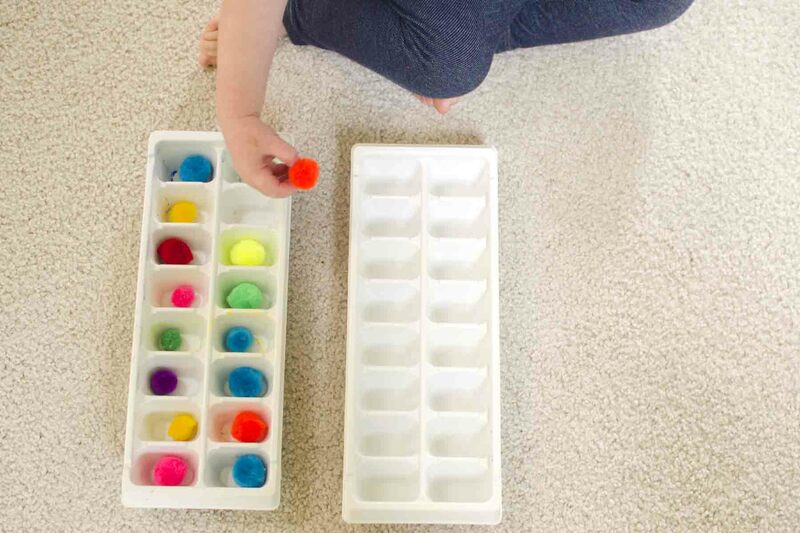 I filled one ice cube tray with pom pom balls and left the other empty. The goal: transfer the pom poms to the other tray. Pom pom balls look tasty for little ones so make sure to use your parental discretion and decide when your toddler is ready to use them. Make sure to supervise all activities. Shockingly enough, little transfer activities like this (and like this one – scoop and transfer) hold little attention spans. They may look simple but they are inviting and captivating. These are the kind of activities I do when I need a few minutes to do a load of laundry or get dinner into the oven. 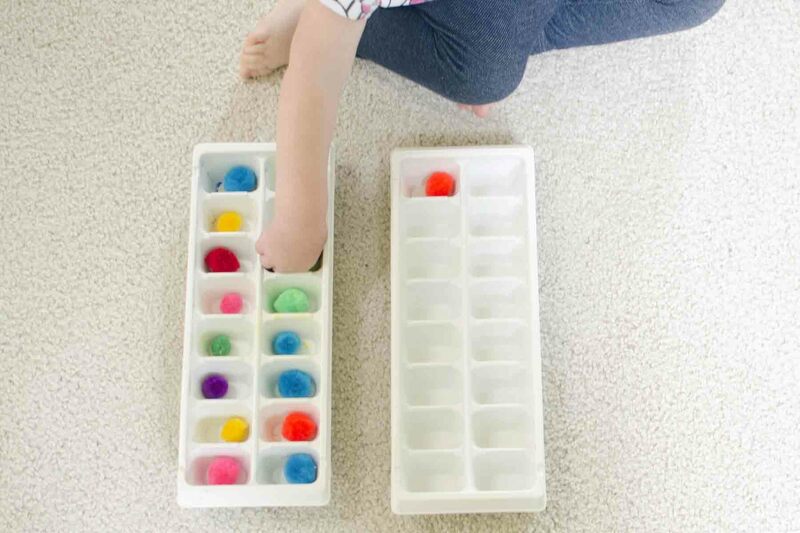 If you have an older toddler on your hands, consider upping the ante in an activity like this. Add a pair of tongs instead of using fingers for a great fine motor skills work out. Add more pom pom balls and make it a sort and transfer activity. The possibilities are endless with transfer activities. 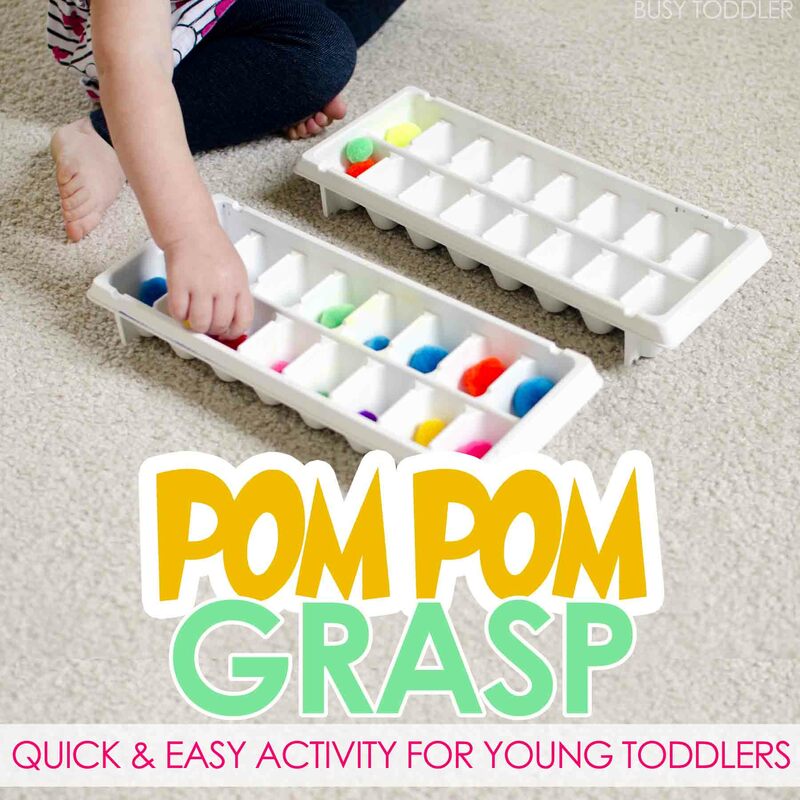 Pom Pom Grasp was the perfect simple activity for my young toddler. It held her attention for just long enough that I could unload the dishwasher, which is all I’m looking for. How fast can you set up Pom Pom Grasp?